Q. You couldn't play much better out there tonight. Can you agree? 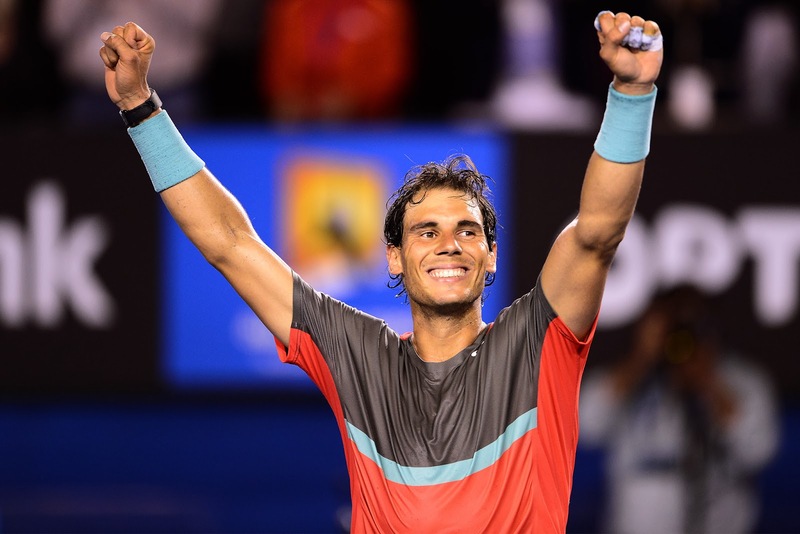 RAFAEL NADAL: I played well tonight. I think I played probably my best match of the tournament. So very, very, very happy for this great new that I played my best match in that semifinal against Roger.He arrived to that match winning two great matches against Tsonga and Andy two days ago. Really very happy the way I played tonight, and very special moment try to have the chance to be in another final. Q. How critical do you think it was to win that first set tiebreak to get in front? RAFAEL NADAL: For sure was very, very important. Was decisive to win that first set, after winning the first set, a tough first set. So after a few tough rallies at the end of the first set, was a lot of confidence for me.Is true that he had Love 30 during the set before. But is true that I had more breakpoints than him, no? I had few ones that I had the chance.But it's fine. I think I played great. The first set, as I said, I played solid at the end of the tiebreak. Just can remember one important mistake with the return, second serve. I don't know, probably was 5 3.In the deuce position I made second serve return with a backhand that I had mistake. That is the only point I am not happy about the way that I played on the tiebreak.With 5 1, I missed a forehand down the line but was the right shot. Missed it for just little bit. So happy about the whole match. Yes, the first set was very important. Q. Do you think he was more aggressive than usual in the first set? He was coming to the net more often. RAFAEL NADAL: No, he's trying to play aggressive. Sure he's trying to play more aggressive, but I think he tried against me in the past, no, with success.Is nothing completely new that he's playing aggressive. He's a very aggressive player. He's one of these players that he's able to win the point in one shot, in two shots.So not everybody's able to play that way. He's one of these players that is able to play that way. That's very difficult to stop. Q. Because you have such a good record against Roger, do you go on court with a very clear mind against him? RAFAEL NADAL: No, I go on court knowing that is a really tough match and if I am not playing my best, I will not have the chance to win, so...Every time I go on court I know what I have to do, but I don't know if I will be able to do it or if he will give me the chance to play the way that I want to play.So, sure, when I go on court, I go with doubts. The doubts are good. Is not a bad thing have doubts before the match. As I say, I know the way that I want to play against him and against everybody, but the problem is I am not able to do it every time that I want. Q. A couple days ago Roger said that Stefan had a couple ideas on how he should best approach you for this match. Did you notice any different tactics from Roger this time that you hadn't noticed before? RAFAEL NADAL: I don't know. I think he tried to play very aggressive, taking the ball very early. But if you go to YouTube and you see the video of 2012 match, you will see that he was playing very, very aggressive, too. Especially the beginning of the match. So is nothing completely new. I saw that video today, the morning. I see the way that he will try to play again. But important thing for me is serve well, resist the beginning. I know he will try to go on court going for the winners, taking the ball very early.So when the match is coming and the match is longer, then that's more difficult. Because physically is very difficult for me, for him, for everybody to play with that intensity of trying to play that aggressive during a few hours, no, because mentally and physically is very tough.So when the match is going on, I know that I will have the chance to hit a little bit more rallies. That's the position that I want to be. So is very important to resist the score at the beginning. Q. You served almost exclusively to his backhand. Is that knowledge you require by knowing him so well, playing him so many times? RAFAEL NADAL: I serve what I can serve. I serve at the position that I feel that I will have the chance to start better the point. And today I felt that serving against his backhand I had the chance to start the point with little bit of an advantage. That's what I tried.If that didn't work, so I will change. I will try to play the serve, you know, more combined. But was working well because I didn't had many breakpoints against. The serve that I lost was in the third, 2 1, I think, I lost that serve because I played bad from the baseline, not because of the serve. Q. It seemed from watching that you were moving as freely as you have done for quite some time. Do you feel as though your movement is exactly where you'd like it to be at the moment? RAFAEL NADAL: I think I am quick today. I am moving quick. I am able to come back from a difficult situations, you know. With great shots of the opponent I am able to keep producing power on the shots. And produce great shots from very difficult positions.That's because the movements are ready and because I feel the power in the legs when I arrive in tough positions, and, sure, the confidence on the shots. I hit a few passing shots today that if is not because you are quick and playing with confidence, you cannot hit that shots. Q. Have you watched any of Stan's matches this week? What do you think he's doing differently in this tournament or recently that makes him a better player, being able to beat Djokovic? RAFAEL NADAL: Yeah, I saw him play against Novak. I saw him play against Berdych. He's playing great. I know him. He's a good friend, great guy. So happy for him that he's in the final. He deserve it. He's playing better and better every year.He's serving unbelievable. He's hitting the ball very strong from the baseline. Very, very quick. Is very difficult to play against him today. I know will be a very, very tough match. If I am not able to play my best, I think I will not have chances because he's coming to this match with a lot of victories and playing great. Q. You took a timeout because of the blister. You said the other day you were having trouble serving. Any problems with that tonight at all? RAFAEL NADAL: We maked the tape a little bit smaller. That help me. Is true that making the tape smaller, I assume a little bit more risk that the tape can go. I don't know how many times I can change the tape during the match, because to change the tape I need the trainer. I need to wait at the end of the set, or if is an emergency that happen that the tape gone in that point.So I need the trainer in that moment. If that happen again, I don't know how the rules are, but is a little bit more risky. But the blister is good. Is not bad. Looks better every day. We are doing the right things. Blister today is not a problem any more for normal life. Is not painful.Problem is to play tennis. The only problem is the position of the blister, the place. Because if is in another place, I will no have problem because I don't feel pain today. Problem is to cover that blister in the position where that is. Q. Having won 12 times in a row versus Wawrinka, is it a relief that you have to play best of five? He has never won one set. He can win one; he can win two; but to win three is even more difficult. Don't you think so? RAFAEL NADAL: No. You play a normal match, no. For me, no. If you play a match, you play a Grand Slam final, that's a different kind of match than I played against him in the past.He's playing better than ever. Is not a question of winning one or two. Is a question that he's a player that is ready to win against everybody today. If I don't play my best tennis, I am sure that he will win three sets against me. I don't going to have the chance to beat him.I am really focused that I know that I need to play like today, and if not I will not have a chance to win the final. Is not the final that I think playing normal I going to win; I need to play my best. Q. Before the match they were having some problems opening the roof. Did they talk to you about that? Q. Were you concerned if the roof was closed it would change the conditions a bit? RAFAEL NADAL: No. No, I prefer to play outdoors. But, you know, the history that I don't play that well in indoors is true, but is not only a question of indoor, is a question of the court, no?When we are playing indoors, we play normally in that surface that is like a (indiscernible), you know, when the ball stays a little bit low. If we were playing indoors in this court, I don't know how to say, but the material how to say, but the bounce is still going higher, so is not a big deal to play indoors here. That is my feeling. Q. You have a wonderful record against Federer; you've won recently on all surfaces. Can you talk about success against Roger. RAFAEL NADAL: Well, the real thing is I played a lot of times against him, and a lot of times I played great against him. So probably that's why I had this success against him.But you never know when that stop. Today I am happy that I am able to win against him again. When you go on court against Roger, even if we played each other 32 times I think before this one and I was able to win against him 22, I go on court knowing that I am playing against a player that is unbelievable.What happened in the past probably will not help me. I take every match like a different history and every day is different. Sure, helps the matches that I won against him in the past to make me feel confident in the way that I have to play, but that's doesn't mean that I will have the chance to do it again. Q. You said on court it was emotional for you. How much does it mean to get to the final, especially when you weren't able to be here last year? RAFAEL NADAL: Well, for me it's a very important thing start the season this way again, winning in Doha, now being in the final of Australia after missing this tournament last year. Come back here, the support of the crowd is just amazing for me. Just can say thank you very much everybody.Very emotional moments in the Rod Laver Arena in the past, very emotional moments this year especially because is the Grand Slam that I really had more problems in my career.2006 I didn't had the chance to play for the injury on the feet at the end of 2005 in Madrid. I remember 2010 and '11. 2010 I think was against Andy I had to retire because of a problem in the knee; 2011 I didn't want to retire but I had a strain on the muscle in my leg third game of the match; last year I didn't have a chance to play here.Lot of years I didn't have a chance to play in this tournament that I really love so much with the perfect conditions, so is very special have the chance to be in the final here again. Q. Were you aware that apparently just after the start of the second set, when you were having your treatment, that Roger had quite a long exchange with the umpire suggesting that you were grunting a little louder than normal and it was putting him off? RAFAEL NADAL: I really don't know that. When I am playing, when I am hitting the ball during the point, the last thing that I am thinking is try to bother the opponent. Only thing that I am focusing is try to hit my ball well. That's it.I am sorry if I bothered somebody, but I never did in the past. So is something that nobody in my career, you know, told me nothing about this, that I am bothering the opponent. But if I bothered him in any moment, he knows 100% it was not because I wanted. I never do nothing on court to bother the opponent. I think I did the normal things that I do in every match.